Looking for the next place to host your group gathering? Group Dining or Private Party rooms are available in our upstairs dining areas. Perfect for your funeral luncheon, Retirement Party, Bridal Showers, Rehearsal Dinners, Baby Showeres, Birthday Parties or any Celebration where you need a private dining area. Buffet menus available starting at only $13.95 per person! Please give us a call at 610-395-9622 for further details. Sunset Grille Supports your Cause! Sunset Grille invites you to participate in our Dining for a Cause fundraiser program. Dining for a Cause is a fun and easy way for Sunset Grille to assist you in raising funds for a cause or organization of your choice. Do you have an organization you would like to raise money for? Give us a call to set up a special night for you and your supporters to eat and have fun at the Sunset Grille and we will give back to your organization 15% of the total food sales for that evening. We will provide our restaurant, staff, and a Dining for a Cause Voucher for your guests. When your friends and family hand in your organizations vouchers on the day of the event, 15% of their purchase will be donated directly back to your organization. Apply to host a fundraiser at the Sunset Grille, Allentown PA by following the link below or give us a call at 610-395-9622. Remember, we'll donate 15% of sales (excluding alcohol sales, tax and gratuity) from your supporters back to your organization. It's a win-win for everyone. Hosting a fundraiser at The Sunset Grille is easy! Everything you need is located directly on our website. Did you hear that Sunset and Grub Hub have parterned to offer delivery to our customers. Its so simple, go to Grub Hub and find Sunset Grille and place your order. 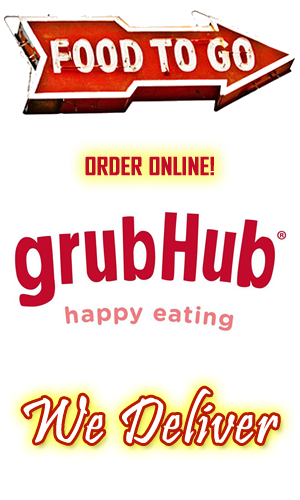 We will prepare your order and a Grub Hub driver picks it up and delivers it right to your door. Happy Eating! If you prefer to pick it up, you can order through our website by clicking below. Superbowl 2018 - Sunset Party Pack Wings to Fly! Superbowl wings party packs are here! Pre-order your wings for your party to ensure availability!